Adventures in the Endless Pursuit of Entertainment: Great Scott! The Pipes of Christmas are Coming! Great Scott! The Pipes of Christmas are Coming! This Saturday, December 19th, the Scots will be invade the Upper East Side of Manhattan (and they'll move over to New Jersey on Sunday, December 20th). Specifically it's the Highland pipes and drums of Scotland along with brass, strings, and percussion native to Scotland, Ireland, and Wales. This Celtic concert, the Pipes of Christmas, celebrates the holidays and the Christmas season like no other. I have been attending the Pipes of Christmas annually since 2010. This concert of music and readings stirs my soul and reminds me not only of the wee dram of Scottish blood in my family line but also of my heritage as a Christian celebrating the birth of Jesus Christ. It's one of my favorite events of the entire year and I plan my December around it. The Pipes of Christmas is produced by Clan Curry Society to both celebrate the season and raise money for its international music scholarship program that includes annual gifts to students in the United States, Scotland and Canada. Performing are the fiddle champions, Paul Woodiel and Calum Pasqua, "Riverdance" piper, Christopher Layer, guitarist Steve Gibb from "Jersey Boys", cellist Sarah Hewitt-Roth, Scottish Country Dance aficionado Susie Petrov, bassist Mark Verdino, the Solid Brass ensemble, organist William Peek, Scottish Gaelic Mod Champion harpist Jennifer Port and the Kevin Ray Blandford Memorial Pipe Band of Redlands, CA. This year, the Pipes of Christmas also honors the late Academy Award winning composer James Horner. Horner composed hundreds of film scores, including "Titanic," "A Beautiful Mind," "Field of Dreams," and notably "Braveheart" which tells the story of Scottish hero William Wallace to who led the Scots in the First War of Scottish Independece against King Edward 1 of England. To pay tribute to James Horner's legacy of bringing Celtic music to a broader audience, three "Braveheart" case members - Mhairi Calvey, James Robison, and Andrew Weir - are reuniting to perform readings. It's thrilling to hear their brogues as well as speak in native Scots. The concert will also feature the world premier of a new work composed by a music student of Edinburgh Napier University as part of the university's Christmas Composition Contest which is sponsored by Scottish writer Alexander McCall Smith ("No. 1 Ladies' Detective Agency" series). 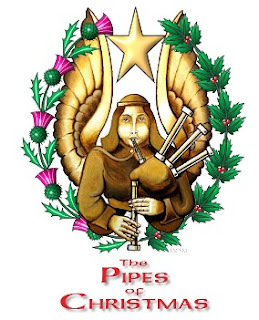 The Pipes of Christmas opens on Saturday, December 19th at the Madison Avenue Presbyterian Church, located at 921 Madison Avenue (at 73rd Street) with performances at 2PM and 7PM. The concert moves across the Hudson River on Sunday, December 20th to Central Presbyterian Church located at 70 Maple Street in Summit, NJ for 2PM and 7PM performances. Concert highlights will also be televised via cable to 11 New Jersey towns on December 24-26, 2015 and streamed online. Please visit www.pipesofchristmas.com and on facebook.com/ThePipesofChristmas. To experience this miraculous and soul stirring Christmas concert live, visit SmartTix to purchase tickets. Attend Saturday, December 19th at the Madison Avenue Presbyterian Church, located at 921 Madison Avenue (at 73rd Street) with performances at 2PM and 7PM. The concert moves across the Hudson River on Sunday, December 20th to Central Presbyterian Church located at 70 Maple Street in Summit, NJ for 2PM (sold out!) and 7PM performances. A Blithe Yule!